TWELVE-YEAR-OLD CASSANDRA TWIRLED A LONG strand of her fire-gold hair around one finger as she sat before her bedroom desk, waiting. It was Thursday morning, and she was alone for once. No mom, sister, or brother around to bug her. She was supposed to be doing her homework for her Gods and Goddesses of Mount Olympus class, which was due tomorrow. But instead she was working on a very different sort of project. One that had nothing to do with school. A few minutes passed, and then her brown, almond-shaped eyes widened. She smelled peppermints! Which meant she was about to have another vision, since she always smelled peppermints right before she did. Within seconds the vision came to her, floating in a mist in front of her eyes. In it she saw the goddessgirl Athena surrounded by her three best goddessgirl friends, Aphrodite, Persephone, and Artemis. 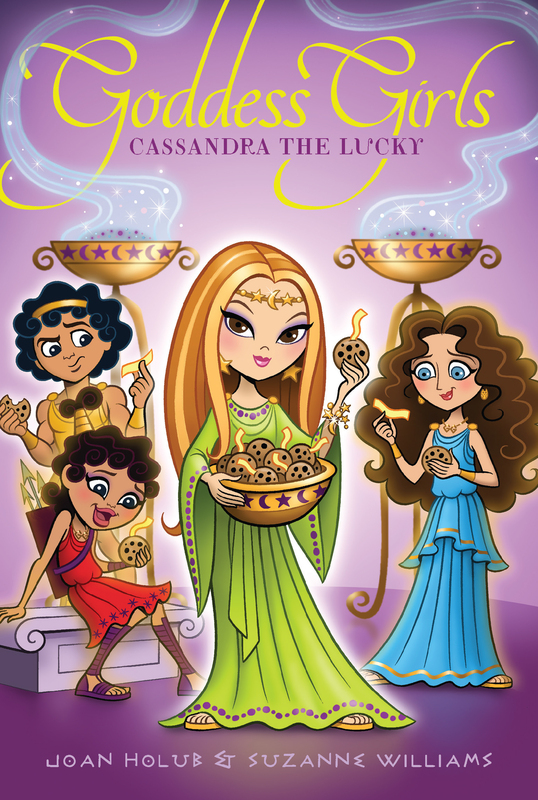 Although Cassandra didn’t know any of these goddessgirls personally, she recognized them from the one time she’d gone to Mount Olympus to attend Zeus and Hera’s wedding. Huh? Cassandra had no idea what that meant. However, she did know for sure that Athena would speak those words sometime in the next few days. Because Cassandra’s prophecies always came true. Even if she was the only one who realized that fact! “What are you doing?” demanded a concerned voice. Cassandra had been concentrating so hard that she jerked her head up in surprise at the sudden question. She looked over to see her older sister, Laodice, coming into the bedroom the two girls shared. The scent of peppermints and the vision both abruptly faded away. Of course, Laodice hadn’t seen the vision. She’d be the first to admit that she couldn’t prophesy her way out of a papyrus bag. Cassandra and her twin brother, Helenus, were the only ones in the family who could see the future. And the fortunes they told—well, her brother’s at least—went into the fortune cookies sold at their family’s store. It was called the Oracle-O Bakery and was here in the Immortal Marketplace, which stood halfway between Earth and Mount Olympus. Her mother had bought the store and this apartment right above it just two months ago. Even though Cassandra and her family were mortals, not immortals, they were fortunately allowed to live and own a shop in the IM. “Nothing. I’m not doing anything,” Cassandra told her sister. Quickly, before she could forget the words she’d foreseen, Athena would speak, she picked up a feather pen. After dipping the quill tip in a bottle of ink, she scribbled the words on a small piece of papyrus exactly one inch by four inches long. Then she set the fortune on a stack of others she’d already written. Money was tight, and her family didn’t have a lot of extra papyrus lying around. So she’d cut up an old drawing she’d done on the bakery letterhead stationery into these slips and written her fortunes on the backs of them. “Are too. You’re fortune-telling again,” Laodice accused gently as she crossed the room. Cassandra shrugged, her gaze flicking to the sundial on the windowsill. She’d been doing fortunes for almost an hour! Time always flew when she was having visions. She got into a mental zone, her own little world, where she didn’t hear or see anything except the prophecies in her head. Prophecies no one ever believed, unfortunately, despite their truth. Instead she was widely considered to be a liar—and that really stung! Laodice went over to the mirror that hung on the wall above her makeup table. As she passed Cassandra, the air stirred the golden moons, stars, and suns in the wind chimes dangling from the ceiling over Cassandra’s desk. They clinked together merrily. Every family that had a shop here in the Immortal Marketplace had a member with some special talent or magical ability, whether they were mortal or immortal. Helenus’s much-praised prophetic talents were deemed sufficiently magical to qualify. Plus their family was royalty. Cassandra’s mom was Queen Hecuba and her dad, King Priam of Troy. And that made Cassandra a Trojan princess! She could see Laodice’s reflection in the mirror as her sister brushed her long black hair and touched up her makeup. Her dark blue eyes went to the small stack of fortunes Cassandra had penned. At the sudden blast the two girls’ eyes met, wide with fear. The noise had come from right below them. It had sounded and felt like an earthquake! “What was that?” asked a rattled Cassandra. Had one of the cookie ovens malfunctioned and exploded or something? But Laodice was already out the door, heading downstairs. Hurriedly Cassandra stuffed the fortunes she’d written into the pocket of the lime-green chiton she was wearing and took off after her sister. When they reached the store one floor below the apartment, the two girls froze in their tracks. There was an enormous hole in the side wall of the shop—one as big as double doors. Clouds of smoke were billowing through it! No, wait, it wasn’t smoke. It was dust! “Construction workers? What are construction workers doing here?” asked Cassandra. Just then her mom breezed into the bakery through the hole. “They’re knocking out a wall to join our store with the scrollbook shop next door,” she explained. She’d forgotten? Typical! Laodice was really beautiful, but she could be an airhead. Ever since she’d turned fifteen, her brain had become pretty empty, unless you counted thoughts about boys. Cassandra felt like pouting as she and her sister headed over to study the big hole in the wall. How could her mom have neglected to tell her that something this important might happen with the store? Nobody around here ever told her anything! It was like they all considered her a little kid. Hello? She was almost thirteen! “But what happened to Mr. Euripides?” she wondered aloud as she peered through the cloud of dust into the scrollbook store. She pronounced his name: “yoo-RIP-uh-deez.” He was the owner of the scrollbook store, and though all of his books were still there on the shelves like always, they were now a little dustier because of the construction. Cassandra nodded, though she felt torn. “Yeah, but it won’t be the same around here without Mr. Euripides.” It would be really fun to work in the scrollbook store however. She’d be able to read books whenever she wanted, as long as there were no customers. Still, she’d kind of miss Mr. Euripides. He was a great author. In fact, he’d won a famous Greek dramatic festival called the City Dionysia a total of five times! He’d told Cassandra she had great potential as a writer and had complimented her on the style of her dramatically written fortunes. Though even he didn’t believe any of them actually came true. “True,” said Cassandra. Although he was awesome at writing tragic plays, she’d always privately thought that running a bookstore had been a tragic mistake for him. He didn’t really have the right people skills and was always hovering over customers, worried they might damage the scrollbooks for sale. She grinned at her sister, nodding. “Yeah, but now who’s going to tell the customers”—she deepened her voice to mimic Mr. Euripides’ thick accent—“ ‘You rip-uh deez books? You buy-uh deez books!’ ” Which of course made Laodice giggle. Sure, he’d been a total worrywart, but Mr. Euripides had always been nice to her, thought Cassandra. And she didn’t have many friends here in the Marketplace. Just one, really—a girl named Andromache who worked in a store called Magical Wagical that her aunt and uncle owned. The store sold all kinds of magic things, including magic tattoos that constantly changed shape, cute magic dogs that never needed to be fed or walked, and Magic Answer Balls that tried to answer any question put to them. The store was way down at the other end of the IM. Both Cassandra and Andromache had moved here from the city of Troy recently, after the Trojan War ended. Andromache had a special talent for baking and liked it way more than Cassandra did, so she hung out at the bakery as much as she could. Although she could be sweet and fun, she was kind of mad most of the time. And the target of her anger was always the same—the immortals on Mount Olympus. Which was actually something the two of them had in common. Because Cassandra was mad at the immortals too. Three of them, anyway! As the construction workers began hanging cloths over the hole in the wall to cut down on dust in the bakery, Laodice elbowed her. “C’mon. It’s almost time to open the store.” Cassandra nodded and turned to follow her sister to the cookie counter. “What’s that?” her mom asked as Cassandra drew near. Cassandra looked back over one shoulder to see a small piece of papyrus lying behind her on the floor. Argh! One of the fortunes had fallen from her pocket! Her mom picked it up. When she realized what it was and read what was written on it, she frowned. Laodice, who was a little ways beyond their mom now, shook her head at Cassandra. Her expression said, Now you’re in for it! “And like I can’t dance,” Laodice put in matter-of-factly. Her sister really didn’t have any sense of rhythm, Cassandra knew. But she was great with customers that came into the bakery. And Helenus was supposedly good at fortune-telling. So just exactly what was Cassandra good at? Getting into trouble, that’s what! Cassandra wished she shared their enthusiasm. But though their mom was a super business whiz and loved running the bakery, the work left her with little time for family. And now with the store’s expansion she’d have even less time to spare. Sometimes Cassandra couldn’t help feeling like she took second place to the bakery in her mom’s affections, or maybe even fourth place, after Laodice and her brother, too. Her mom was always worrying about money problems. They’d paid a lot to buy the store from its previous owners, and now they were working hard to keep everything afloat. Her mom and dad had split up after the war, which is how Cassandra, Laodice, and Helenus had wound up here in the IM. Cassandra wanted the family bakery to succeed. Still, if business cratered, she couldn’t help hoping it would mean they’d all get to move back to Troy—and have things go back to how they used to be! Suddenly Cassandra’s nose wiggled a little. She sniffed the air and smelled—peppermints! Her eyes blinked, wider. As she stared into space, a new vision came to her. This time she saw a cocky teenage boy with blue hair that stuck straight up. He was sitting in Mr. Euripides’ store—er, their store now—autographing scrollbooks tied with blue ribbons. Dozens and dozens of people were lining up to buy them. There was a name on the poster next to him. Homer. She hadn’t heard of him before, but he must be a big-time author. And judging by all the customers buying his books, this seemed like an awesome moneymaking scheme to her. But before she could continue with her prophecy-inspired idea, her brother walked in through the front door of the bakery. “I’m having a vision,” he announced. Everyone, including the construction workers, froze in their tracks, breathlessly waiting to hear what he would say next. Cassandra rolled her eyes. It was so annoying that everyone cared what Helenus had to say when it came to fortune-telling but paid her prophecies no heed at all! Honestly! thought Cassandra. Once again he’d had the same idea as her! They often thought alike when it came to prophecies. She sometimes wondered if it was possible that his visions somehow fed off hers. Because he always seemed to have the same idea she’d had just seconds before. They were twins, but she’d been born first. Maybe that had something to do with it. “Wonderful idea, Helenus!” their mom declared. It was like she hadn’t even heard Cassandra saying the same thing only moments before! Her mom went over to Helenus, and the two continued off into the scrollbook store, discussing “his” idea. Grrr. It really frustrated Cassandra that her brother’s fortunes were always held in high regard by everyone and thought to be absolutely true without question. Hers, on the other hand, were dismissed as silliness, or worse—as lies! Her twin was so lucky. He even got his own room because their older brother Hector was still back in Troy with their dad. Her mom nodded to the box that Helenus kept filled with the written prophecies he came up with. Those prophecies, scribbled down on slips of papyrus, would be placed inside cookies and distributed to mortal customers down on Earth. However, the cookies that went up to the immortals (and a few lucky mortals) on Mount Olympus were magical and spoke their fortunes aloud instead. For those, Helenus would have to whisper a prophecy to each freshly baked cookie before it left the store. That task wouldn’t take him long, however. Certainly not as long as it would take Cassandra to make the dough and bake the actual cookies! “You have to admit, Helenus’s idea for the grand opening is a good one,” Laodice told Cassandra as the two girls finally got to work after their mom and brother left. Laodice began wiping construction dust off the top of the cookie counter and then started sharpening the quill pen they used to write receipts for purchases. “What’s your point?” said Laodice. Her point was that her fortunes were better! And she wasn’t bragging. Not really. For example, she’d known the name of the author who would be at their grand opening—Homer. Her brother hadn’t. Of course, she hadn’t gotten the chance to tell anyone. Feeling unappreciated, Cassandra went to the underground ice-room to get more of the cookie dough she’d made last night. A few minutes later, just as she began rolling the dough out in the small kitchen behind the counter to make the first of many batches of fortune cookies they’d bake and sell in the coming hours, the bell on the store’s front door tinkled. In walked their first customer of the day. A handsome teenage godboy. Laodice smiled at him and went to see if he needed help. Cassandra made a fist and began pounding the cold cookie dough to soften it up. Whomp! She wished she could make her sister understand her frustrations. But although Laodice was only two years older than she was, she seemed to think of Cassandra as a little girl. A little girl without a care in the world and certainly no problems. Ha! She did have problems—plenty of them. And in her opinion they’d all been caused by three immortals from Mount Olympus Academy—Athena, Aphrodite, and Apollo! Whomp! As she pounded the dough, Cassandra thought about the trouble they’d made for her countrymen, meddling in their lives during the Trojan War. Not to mention all the trouble they’d caused her personally. But they probably thought nothing of it—if they ever even thought of her and Troy at all. Cassandra automatically grabbed a rolling pin, dusted it with flour, and began rolling out the dough into a big flat pancake. Her friend Andromache said that the goddessgirls and godboys at Mount Olympus Academy didn’t have any troubles. For them every day was nothing but fun, with parties and dancing and hardly any school-work. Andromache also said that the Three A’s (which was their secret code nickname for Athena, Aphrodite, and Apollo, since their names all started with the letter A) deserved a little payback for the trouble they’d caused Cassandra and other Trojans. She said that they deserved to have some troubles of their own! After Cassandra put the cookies into the oven, she patted her pocket, which was still full of the fortunes she’d written that morning. Andromache was right, she decided. And with the help of these prophecies, she was about to put her and Andromache’s payback plan into effect!